Trails like the well-known Oregon Trail and Santa Fe Trail are National Historic Trails.The Boone’s Lick Road was the connection to these historic trails into the newly acquired Louisiana Purchase Territory from St. Louis Missouri. The Boone’s Lick Road came into use right after the Lewis and Clark Expedition in 1804. It was the primary transportation corridor into the land that became western Missouri until steamboats came into common use about the time Missouri became a state in 1821. The Boone’s Lick Road, in its various courses, remained as the major overland route across central Missouri until US Highway 40 came into use about 1920. There was a time when almost every person, animal, wagon, cart, trade good, and tool of the early pioneers into Western Missouri and beyond, traveled through Williamsburg on the Boone’s Lick Road. The Boone’s Lick Road Association is a Not-for-Profit organization that strives to achieve National Historic Trails status for the Boone’s Lick Road. The Boone’s Lick Road Association archives and shares the fascinating stories of the first road in the heart of Missouri in various methods, to spread and preserve the importance of this road in our national history. Just as the road changed to fulfill needs, the Mission of the Boone’s Lick Road Association will evolve to identify new discoveries and make the history available in up to date communication methods. An ever growing bibliography of books, articles, pictures, and other material for use by those interested in the historic road. Roadside monuments erected at the beginning and end of the Boone’s Lick Road in St. Charles and New Franklin Missouri. You can help the Boone’s Lick Road Association. Your tax-deductible membership can show that there is support for the effort. If you are willing to share documents, pictures, deeds, surveys, artifacts, etc. that have a connection to the Boone’s Lick Road , the Boone’s Lick Road Association will document their history, while you keep you precious article.  Congratulations to cousins Chelsea Edgar, and Ben Edgar, who stayed at the Gray Ghost Trail Inn during Deer Season, for your first white tails. Hope to see you back again next year!  Don’t forget to check out Nita’s Candles for your sweetie for Valentine’s Day.  Lynda’s, this month, is having a 25% off sale on all scarves and Jewelry. Any remaining Christmas merchandise is 20-50% off. Remember your Valentine and shop local!  The Williamsburg Post Office schedule for the month of February 2016 is: Opens at 7:30 am and closes at 11:30 am Monday thru Friday. Saturday hours are 7:30 am to 9:30 am. The Post Office will be closed on Monday February 15, 2016 for Presidents Day.  Joe Crane is receiving treatments for lymphoma. Please keep him and his family in your prayers.  Five miles South of Crane’s Store on County Road 1005, the Missouri Conservation Department has established a public shooting range. This area has been established and maintained and improved over the years until it has become a very popular spot in Eastern Callaway County. If you like shooting, you should try this spot! It features handicapped accessible shooting benches and a 25 yard, 50 yard, and 100 yard ranges. Last month, the subject was butter churns. What did you do with butter after you churned? You formed it into different shapes by using butter molds. The molds came in different shapes, sizes and made of different materials. Wood and glass were probably the two most common types. The molds had many designs carved into the top part of the mold. One of the more common pattern was the pine sample. One of the hardest ones to find is one with the cow. The second picture is a butter press that makes a one-pound brick of butter. It also has a design in the bottom. This design can be changed. These items are on display at Crane’s Museum in Williamsburg MO. Have you been to the apple Wagon Antique Mall? The mall is located on the very Western edge of the Nine Mile Prairie at the Route Z on Calwood Exit. They are open 9-5, 7 days a week. They feature a wide variety of antique booths plus a big selection of Home Decorating items. To get there from downtown Williamsburg, just stay on the old highway and go due West by mules. We want to thank them for referring people to Marlene’s Restaurant. We appreciate the business. What a kick! Today I heard a cute story about an elderly widow and widower who lived in a mobile home park in Florida. They had known each other for years and had become good friends. But each had a senior moment that nearly broke up their budding romance! The meal ended with more pleasant exchanges. They said good night and each went home. LORD, HOW LIKE these two I am sometimes. You ask me to do something, and I can’t remember what it is – or do I intentionally forget? Or I hear you clearly and I simply ignore taking action until it’s too late. Help me today to be attentive to what I say and what is said to me and to rely on you when I have a senior moment! 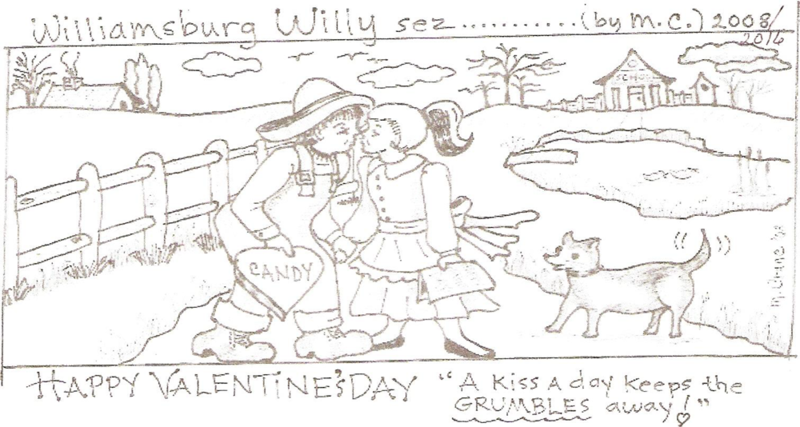 The Williamsburg Villager is provided by Crane’s Museum & Shoppes. Joe Crane is our on location reporter. Please submit any announcements to Joe by the 15th of each month to insure publication.